The journey to Kataragama is supposed to be painful. To get there burnt, battered and blistered is to understand what it offers. By arriving in a van, I’d already placed myself way beyond the realms of comprehension. Many of the people I saw had travelled there on foot. Some had walked the length of the island, a journey of perhaps eighty days. Every year, a few perish in the jungle, and that week there was talk of a woman killed by a leopard. Even those who’d made it looked broken and starved. Their pada yatra, or foot pilgrimage, had left them utterly listless. Swaddled and exhausted, they lay around in rows, like the figures in a Henry Moore. In places, there were thousands of them, spread through the woods. I still find it hard to compute, this landscape of pain and hope. But, since 137 BC, Kataragama has known almost nothing else, and now it gets over a million pilgrims a year, on the promise of atonement. Not everyone walked, although they’d all somehow suffer. On the day I travelled out to Kataragama, it was holding its last procession of the Maha Devalaya. Over 150,000 pilgrims would be heading to the complex. Some had driven all through the night on rice-cultivators, or had ridden down from the hill country, clinging to tractors. Buses were packed so tight that you couldn’t see daylight through the bodies. The traffic jam crept through the scrub like some lumbering polyphonic reptile. Everything hooted or sang, and most of the vehicles had been decorated with greenery, the mark of pilgrimage. At Tissamaharama, this great honking hedge came to a halt, allowing everyone to get off and plunge into the tank. It may have undone a little precious suffering, but at least the gods would be spared the stink. As the pilgrims immersed themselves amongst the lilies, there was a collective coo of pleasure. I abandoned my bags at a guest house and went the rest of the way by trishaw. The driver, who was called Saman, had decorated the interior with pictures of straggly girls in thick black bikinis. I had hoped for something a bit more penitential to get me through the roadblocks. But I needn’t have worried. All around me, the pain had been temporarily suspended, to be replaced with an infectious holiday spirit. Stalls had appeared at the roadside, selling watermelons, bananas and bundles of firewood. Further on, they sold plastic machine-guns and nuts. Cows now grazed amidst the traffic, and the singing got louder. Two incense sellers were fighting on the verge. A huge fish appeared in the door, demanding a buyer. AVOID ENTERING DRUNK, said the signs, but it was a hopeless request in a place so spiritually tipsy. In 1642, the Portuguese had got this far, only to be driven back when their guides went stark raving mad. I was now being carried away in the crush. Fortunately, I could just make out Saman, bobbing along behind. The human torrent swept us out through more toy stalls, confectionery tents, an emporium of coloured string, and up over a bridge across the Menik Oya, or Green River. Below, I could see a bath of biblical dimensions, and hundreds of pilgrims shampooing their hair. Then we were in the temple complex itself, and the crowd swelled with elephants and mahouts. I don’t remember voices, just a smothering mumble of prayer. Eventually, Saman managed to swim through the tangle of arms and drag me off into the trees. I wondered if things ever went too far. I was relieved to be back amongst the lightbulbs. We’d ended up at the heart of the procession, and I could hear whips fizzing and cracking overhead. Drummers came thrashing through the crowds, followed by elephants, blundering along, half blind beneath their enormous burqas of silk. Acrobats swooped in amongst them, a whirr of peacock feathers and silver armour. Then came the dancers, girls in puffed sleeves and pantaloons. For some of them, the heat and the bulbs were too much, and they were scooped up and carried away over the heads of the crowd. Beyond the spectators, the weary slept. It was like a human jigsaw puzzle: Tamils and Sinhalese slotted together so tightly that nothing could move. Tiny fires smouldered amongst them, and the heat that rose off this pile of sleep was pleasantly scented with camphor and woodsmoke. Tomorrow they’d all go home, sore, perhaps, but, arguably, atoned. They’d also return to their separate lives, whether Buddhist or Hindu. Neighbours they might be, but between them there’d always be a gulf of ideas. Only once a year did their lives truly interlock. Kataragama may have been strange – extreme, even – but it was also Sri Lanka at its most complete. 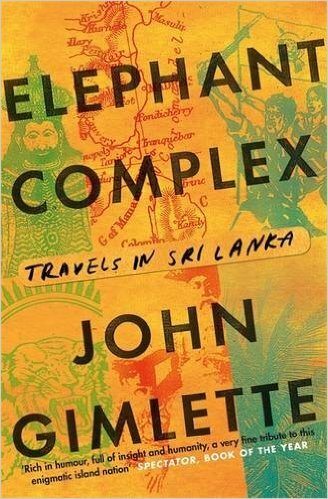 Extracted from Elephant Complex: Travels in Sri Lanka by John Gimlette, which is published in paperback by riverrun, a new imprint of Quercus, on August 4. For more of John Gimlette’s writing, see his website. For an interview with the author, see Telegraph Travel.